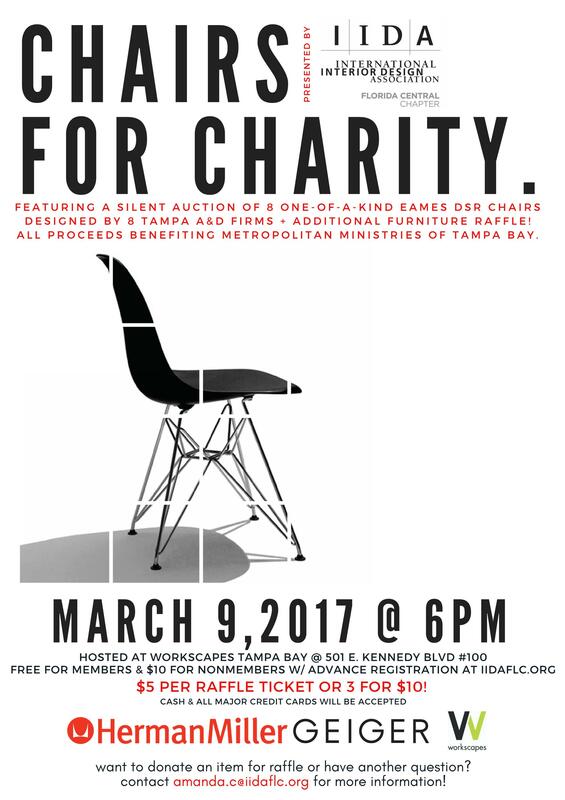 Creativity, competitiveness, and giving back to charity will all merge at IIDA Tampa Bay's upcoming "Chairs for Charity" event on March 9th at 6pm - see flyer for more details! 8 teams will have three weeks to reinterpret the form and function of a given Eames DSR chair through additive or subtractive methods. Chairs will be auctioned off for charity with all proceeds benefiting Metropolitan Ministries of Tampa Bay! Team chairs with the top 3 bids will also win prizes! Additional chairs and items will also be raffled off for charity! We hope you'll join us for a night of drinks, food, design, and giving back to our community!